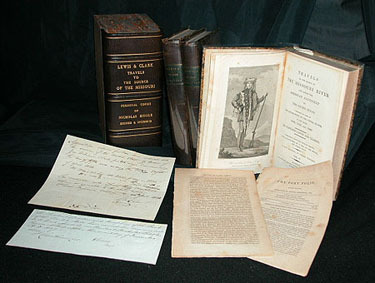 Perhaps the most significant grouping of rare early-edition publications chronicling the1803-06 Lewis and Clark Corps of Discovery reposes not in the Smithsonian Institute but on a piece of the battlefield where Lt. Col. George Custer and members of his 7th Cavalry discovered too many attack-wise Indians. Odd as it may seem, that the new exhibit at the small Custer Battlefield Museum at Garryowen may be a touch better than one producible at the government’s famed and mighty Smithsonian occurs because it includes the personal hand – notated and signed set belonging to the editor of the first officially authorized publication of the journal notes of Meriwether Lewis and William Clark. This seeming quirk of location is due to the zeal and dedication for collecting American historical memorabilia of Chris Kortlander, owner of the exhibit and also director of the battlefield museum. 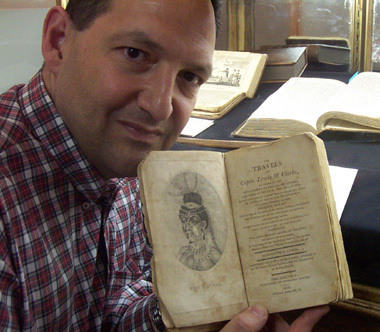 “ What makes this so spectacular is that most of the important rare books relating to the historical Lewis and Clark expedition are now on display,” says Kortlander. “I think it’s important for people to know that we have these in our state.” Beside the Biddle set (the British edition published in 1815), the exhibit includes the official 1814- published American edition, the 1811-published journal of expedition member Sgt. 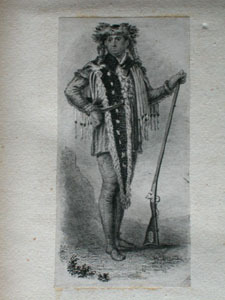 Patrick Gass, a cobbled- together and 1809 published “counterfeit” description of the journey, an original document signed by Clark and a peace pipe believed to be to linked to the trek. The truly unique British set belonged to Nicholas Biddle, the first president of the Bank of the United States of America under President Thomas Jefferson and administrator and editor-publisher of the official version of the journals that appeared in 1814, with editing help from Paul Allen. Beyond Biddle’s personal set, only less than 30 of these first editions sets are known still to exist, Kortlander says. “He was hand-picked by Jefferson to help coordinate the financial matters of the trek,” notes the director. “These are Nicholas Biddle’s personal copies with original hand-written notes, newspaper articles and originally autographed twice. This is the only set owned by the publisher.” Moreover, it includes the first government-produced images of Lewis and Clark, original steel plate engravings commissioned by the U.S. Treasury. A Biddle notation in the book: “The vignette portraits at the end of the English preface are from banknote proofs engraved by Toppan: Gov. 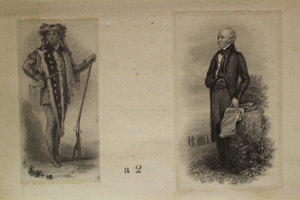 Clark is said to be a good likeness.” The director says Biddle borrowed them from Treasury and tipped them into his personal copy, which also included contemporary newspaper clippings about the deaths of Lewis and Clark. The peace pipe is a curious enigma. A display description invites viewers to wonder if the item might have been on the historic expedition, for hand-carved on its soapstone bowl and ash-wood stem are the names of Gass, Sacajawea and a British Dr. McTavish who is recorded as visiting the expedition as it wintered on the Oregon coast. Also carved are two birds, a male bust, a male and female elk and the year “1806” twice. The exhibit’s so-called “Apocrypha” is the first published account of the Lewis and Clark trek. Compiled by Hubbard Lester, it began to appear in 1809. “Published and assembled without permission, it was declared counterfeit,” explains Kortlander. “Lester relied on letters and reports from other sources. 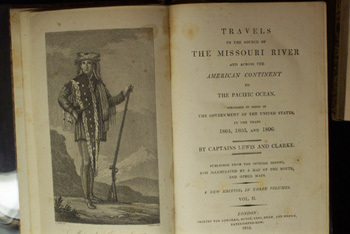 However, it did serve to whet the public appetite for the great adventure.” On his title page, Lester promises all the scoop about the expedition “from various authentic sources and documents (including) from the Official Communication of Meriwether Lewis, “It was published in Philadelphia for $1.69. 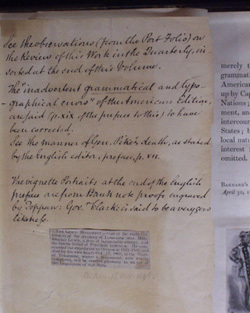 Historical editor Donald Jackson says Lester’s book was based partly on the Gass journal, two Clark letters, data about some Indian tribes by British trader Alexander MacKenzie, a statistical view on tribes by Lewis, extracts from a Jefferson message, “an essay of Jonathan Carver’s published without credit to the author and some miscellany.” Kortlander’s 1811 copy of the Gass journal has some expedition sketches (not by Gass), is leather-bound and cost about $1 in November 1811. The travel of the details of the famed expedition to the printed page is a soap opera in itself. Lewis set off with good intentions to publish his journals after the fanfare following return of the corps, but he knew he needed help to get the job done. He set about making arrangements for aid on the naturalistic part of his gathered data and connected with publisher-bookseller John Conrad of Philadelphia to make a commitment and work up a formal prospectus to advertise the coming volumes. His dismay at the thought of other trek journals or accounts coming out before his was reflected in his public notice in the National Intelligencer on March 14, 1807. “Having been informed that there were several unauthorized and probably some spurious publications now preparing for the press (on the expedition) by individuals entirely unknown to me, I have considered it a duty which I owe the public, as well as myself, to put them on their guard…lest from the practice of such impositions they may be taught to depreciate the worth of the work which I am myself preparing for publication before it can possibly appear, as much time, labor and expense are absolutely necessary in order to do justice to the several subjects which it will embrace,” Lewis wrote. Lewis said only Robert Frazier had been given permission by Clark or himself to publish anything about the “late voyage,” an OK that he was rescinding upon seeing a Frazier prospectus promising natural history details that seemed to overreach his understanding level. “(Frazier) was only a private on this expedition, is entirely unacquainted with celestial observations, mineralogy, botany or zoology and therefore cannot possibly give any accurate information on those subjects, nor on that of geography, and that the whole which can be expected from his Journal is merely a limited detail of our daily transactions,” the explorer affirmed. On March 23, Pittsburgh bookseller David McKeehan printed a proposal for the Gass journal as a nearly 300-page work that would cost $1.00, with a 12.5-cent discount to those who ordered early and a free copy to anyone drumming up 10 other subscribers. And by April 7, McKeehan is blasting Lewis in an open letter printed in the Pittsburgh Gazette for his rebuking criticism of Frazier and other would-be publishing journalists. He accused Lewis of becoming swell-headed and greedily trying to keep the value of his own upcoming work from depreciating. “I am afraid Captain Clarke, who appears to have acted during the whole of the tour with the greatest prudence, firmness and courage, will be forced to blush for the man he has called his friend,” the bookseller ragged. He wondered by what right Lewis could decide what was authorized about “my tour” when it was a government-paid operation. “I’ll squeeze the nation first and then raise a heavy contribution on the citizens individually; I’ll cry down these one-volume journals and frighten the publishers; and no man, woman or child shall read a word about my tour, unless they enter their names on my lists and pay what price I shall afterwards fix on my three volumes and map,” McKeehan suggested as the Lewis mindset. And thus headed Lewis for St. Louis to take over duties as Jefferson’s new governor for the Louisiana Territory – and any further progress by Lewis on the project never seemed to materialize, despite urgings from Conrad, Jefferson, Clark and others. All indications are that he got bogged down by the difficulties of being governor, his personal running skirmish with his jealous territorial secretary (Frederick Bates), his deepening financial woes as the War Department questioned many of his expenditures and claims from the expedition as well as during his tenure in St. Louis and a seeming onslaught of health problems, including heavy drinking and probably severe depression. Lewis’ behavior had became erratic. By September 1809, Lewis and Clark both decided to travel to Washington to discuss matters with the War Department, including protested bills from Lewis. Lewis also told Clark he would go to Philadelphia to get the publication process started. But Lewis, with his journals and other belongings, set off toward New Orleans for a water trip, and Clark was to travel by land. They never saw one another again. He told lies, including advising fort commander Capt. Gilbert Russell that all the work on his journals was complete and ready for the press. When deemed ready to travel again, he decided an overland trip via the Natchez Trace was safer with the journals rather than an ocean boat ride susceptible to British confiscation of the journals. Near present-day Nashville, at Grinder’s Inn, he apparently shot and razored himself to death, leaving the task of seeing the journals into print to Clark and Jefferson. 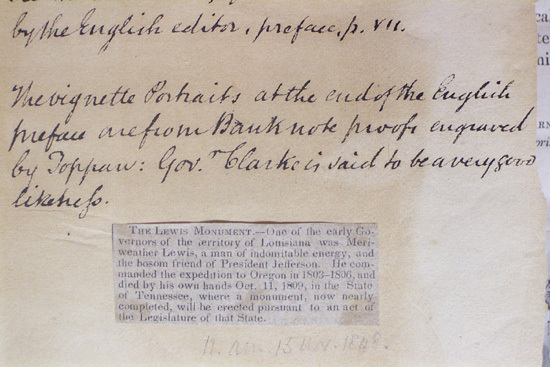 Upon learning of Lewis’ death, his publishers asked Jefferson what to do now. “(Lewis) never furnished us with a line of the (manuscript),” they said. There was talk about Jefferson taking over the project, with Clark going to see the publishers to discuss the situation. But the former president was 65 years old and wished to spend his remaining years as a gentleman farmer. After some effort, Clark convinced Nicholas Biddle, then a 26-year-old prodigy admitted to the University of Pennsylvania at age 10 and awarded a Princeton University degree at age 15, to take over the project. Biddle, who married one of the richest women in the country, took nothing for more than two years of full-time labor on the project and hired Paul Allen to do some copyediting for $500. Biddle’s published proposal of May 1810 lamented the delay caused by the death of Lewis and other factors. 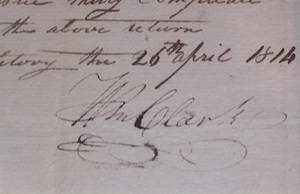 “This delay, although it has disappointed the public expectation and given rise to several imperfect accounts of the journey, may be the less regretted, as the residence of both Captains Lewis and Clarke in Louisiana has enabled them greatly to extend and mature their knowledge of the country which they describe,” Biddle announced. But when Biddle was ready to turn over the narrative volume to the printer, the War of 1812 broke out, and the firm of C. and A. Conrad of Philadelphia collapsed. Knowing “the work will lose some of its interest by so much delay,” it took him more than a year to find Bradford and Inskeep of Philadelphia as new publishers. The 1814 volumes is a narrative and paraphrase of the journals, true to the original but with corrected spellings. And Biddle did little with the flora and fauna because the expert recruited by Biddle could not complete that task when his health failed. Initially, 1,417 copies of the narrative were printed and priced at $6 each. They sold slowly, with the Gass and other versions out. For 90 years, the Biddle edition was the only printed account based on the journals, which means Lewis and Clark got little credit or notoriety for most of their discoveries. Places, animals, plants and birds they discovered were “rediscovered” by others, who gave them the names that stuck. Biddle’s name appears printed nowhere in his edition, for he apparently favored anonymity, giving Paul Allen the “prepared for press by” nod on the title page. And Lewis became almost forgotten over the years, while Clark was more remembered for work as follow-up Louisiana Territory governor. Until 1901, when the government created the $10 “Buffalo Bill” with Lewis and Clark on it to create interest for the upcoming Lewis and Clark Centennial Exposition at Portland, Ore., and 1904, when Reuben Gold Thwaites of the Wisconsin State Historical Society published (in eight volumes) the complete original journals, including never-prior-seen journals from two of the enlisted men. Thwaites’ work is the definitive scholarly treatment and most quoted, supplemented in 1962 by Donald Jackson’s footnoted collection of letters relating to the expedition and Gary Moulton’s 1980s treatment of the journals with expanded new material and more emphasis on botany and other scientific subjects. Jefferson ordered from Biddle 13 bound and hardboard copies of the edition. And Clark, by 1821, is writing to Biddle to see if he can gain anything from the publishers for the book and, also importantly, if he can get any copies of the book. “If any Books are recovered for me, please send a Copy to me as but few are to be met with in this country & none to purchase & I have never found any,” Clark explains. Clark would not be surprised they still are rare today.